Challenge your spouse to a charming card game that sends you both on secret missions to win sweet rewards. Competition has never been this romantic. Challenge your spouse to be the best you both can be with this charming card game that rewards sweet behavior. While most games begin and end within a span of a few hours, this one lasts for a full week, sending you both on secret missions to carry groceries, cook dinner, and more to earn points. The winner can select a reward from a plethora of pampering pluses including breakfast in bed and a shopping spree, a perfect gift for weddings, birthdays, and golden anniversaries. Made in the USA. A cute "paper" first-year wedding anniversary gift! Looking forward to seeing all the cards and "chores." I am very disappointed in this game, the premise is a lot of fun however the execution is poor. The items that are the "challenges" are everyday things. Maybe this would be a fun idea for newly weds, but for those who have been married a long time it is things that should be done anyways. I have bought this again and again. I originally purchased this for myself. My husband and I had so much fun playing the game that I now have repurchased it several times for friends. You play this game over time, so it's a lot of fun for the money. These are always great gifts and uncommon gifts that people love. I bought this for my husband for Christmas- it's been a lot of fun already. There are two variations on the game and both are great. 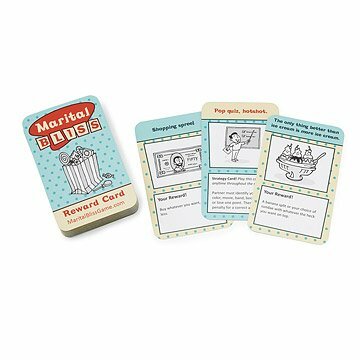 Great quality and fun cards/interactive game for a couple that is newly married or has been together for years. My aunt and uncle loved it. Great interactive game for busy couples! Love this game. It's so fun that we are "competing" to do nice things for each other. We didn't have any problems with the instructions, like another reviewer did. Our instructions said to draw seven "missions" and the strategy cards were just mixed into the pile of mission cards. Love it! I haven't used this product, as it is a gift, but I am so excited for them to get it!